Part 2 will be dedicated to selecting parameters for our power system. These parameters are essential for drawing the sequence network diagrams and hand-calculating short circuit current and voltage quantities. In part 2a, we will be selecting the parameters for the synchronous generator. 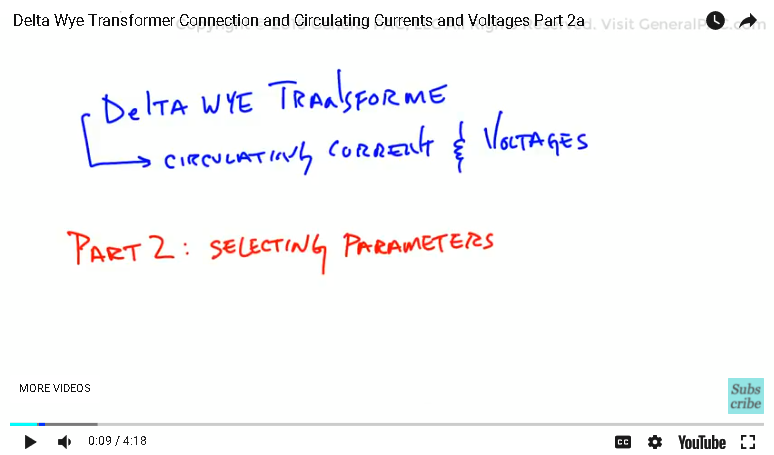 In part 2b, we shall select parameters for the delta wye transformer. Suppose we have a power source that has a 3 phase short-circuit rating of 600 MVA. 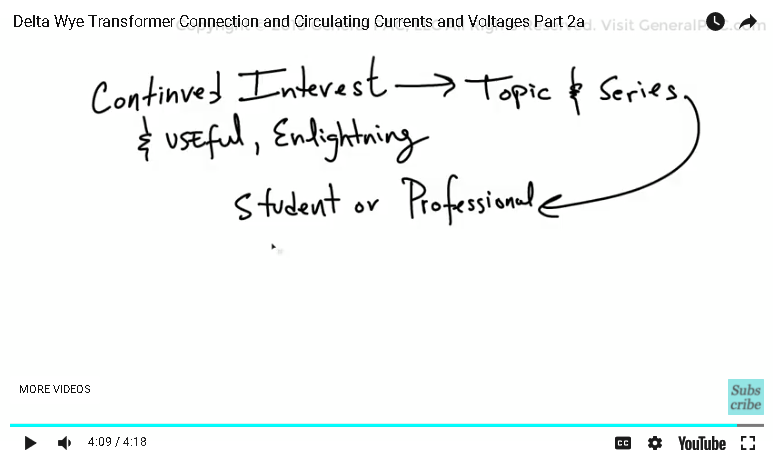 The fundamental equation of short circuit is essentially voltage divided by impedance. So the 600 MVA rating should give us an impedance value. So the 600 MVA rating should give us an impedance value. We can find credible references that shows us how to convert this parameter to an impedance value. In Lewis Blackburns book, Appendix 4.1 is dedicated to exactly this. 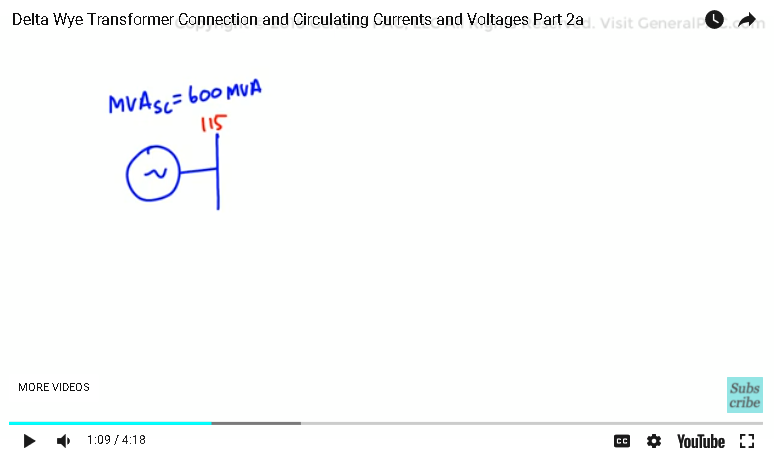 The MVA Short circuit is equal to the 3 phase fault current MVA. 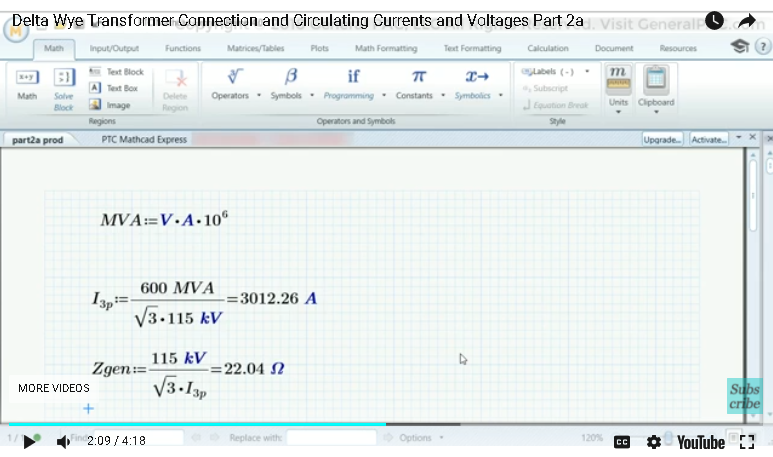 Which is equal to the square root of three, times the 3phase current, times the base voltage. 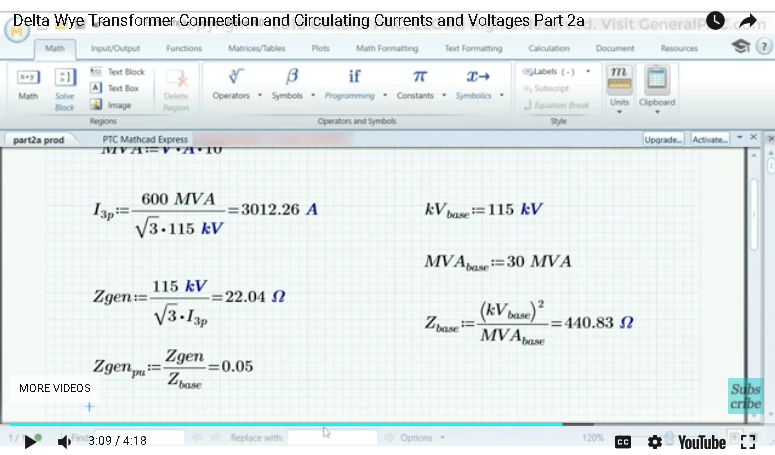 We can now calculate the impedance value by dividing the voltage over the current, times the square root of 3. 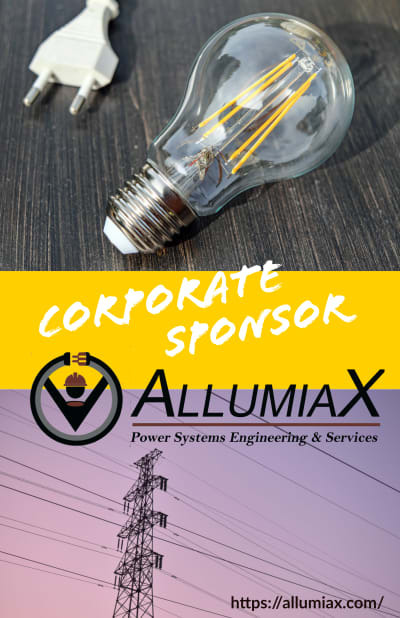 The square root of 3 must be accounted for, because it converts the voltage to a line-to-ground quantity, from the given 115kV line-to-line quantity. The impedance value is calculated as 22.04 ohms. Hand-calculated short circuit currents are best performed in the per unit system. So let us select the base units. We have already selected the base for the voltage which is 115kV. Let us strategically select a power base of 30 MVA. This strategy will be explained when we calculate the transformer impedance. Please also note, in many books, articles, and modelling software, the power base is almost always selected as 100 MVA. But we have selected 30MVA for our power base. The impedance base is simply the base voltage squared divided by the power base. To convert the impedance value to a per unit value, we simply divide the given impedance by the impedance base. Now let us convert the 22.04 ohms to a per unit base, which now equals 0.05. The per unit system is unitless. This parameter can be considered as the Synchronous impedance of the generator. For simplification purposes, we shall only consider the synchronous impedance. To drive this point further, we shall set the transient and sub-transient impedances to equal 0.05 per unit as well. Furthermore, we shall set this impedance to be purely reactive, which means there will be no real component to the per unit impedance quantity. All of the equations in this example can be found in many books and online references. They are also explained in Appendix 4.1 in Blackburn’s book. In part 2b, we shall calculate the impedance values for the Delta Wye Transformer, and explain why we selected the 30 MVA power base.